1) In multitasking, several programs are executed concurrently e.g. Java compiler and a Java IDE like Netbeans or Eclipse, while in multi-threading multiple threads execute either same or different part of program multiple times at the same time. 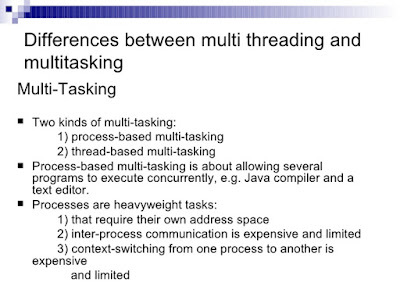 2) Multi-threading is more granular than multi-tasking. In multi-tasking, CPU switches between multiple programs to complete their execution in real time, while in multi-threading CPU switches between multiple threads of the same program. Remember, switching between multiple processes has more context switching cost than switching between multiple threads of the same program. 3) Process are heavyweight as compared to threads, they require their own address space, which means multi-tasking is heavy compared to multithreading. Inter-process communication is expensive and limited and context switching from one process to another is expensive and limited. See difference between a Process and a Thread to learn more. That's all about the difference between multitasking and multithreading. Both are used to parallelize things in order to take full advantage of expensive hardware and CPU. Multitasking is an ability of a computer to execute multiple programs at the same time while multi-threading is the ability of a process to execute multiple threads at the same time. Sometimes multitasking is useful and other time multi-threading.